‍From left to right, Mr. Arun Natarajan, Technical Sales Consultant and Ms. Chelsea Andrews, Technical Director at XpertSea, will be visiting Bangladesh shrimp producers. A Canadian company wants to use artificial intelligence to drive profits and sustainability in Bangladesh fast-growing aquaculture industry. According to the U.N.’s Food and Agriculture Administration, Bangladesh is among the world's top five aquaculture-producing countries, producing four times more farmed seafood than the United States. But the lack of modern technologies means the aquaculture industry needlessly wastes time and money. 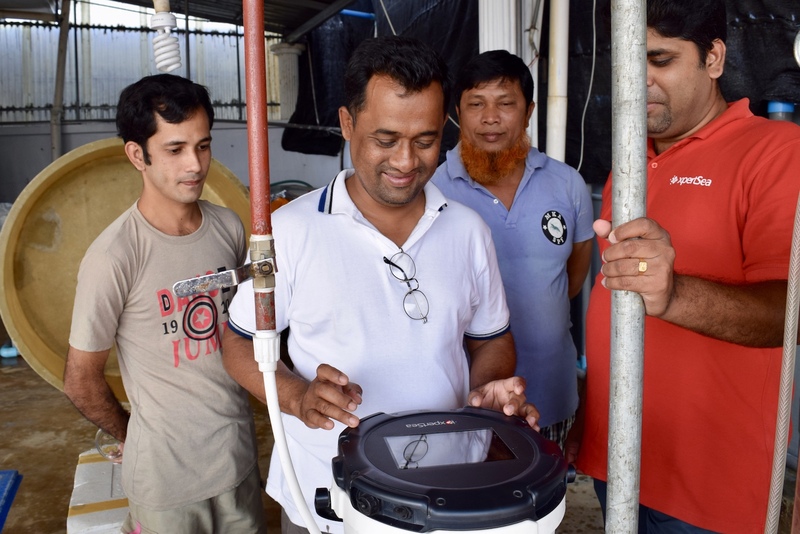 Antiquated practices such as manual sampling, visual inspection and non-digital records are widespread, and inventory survival rates hover around 50% for a typical shrimp farmer. Without modern tools, aquaculture's potential is being held back. To help solve this technology gap, XpertSea - a Canadian company developing technologies to transform aquaculture into a modern, efficient and sustainable practice -- will launch its services in Bangladesh on February 21. XpertSea’s smart device, the XperCount, is a portable ”magic bucket” that can count and size thousands of small aquatic organisms in seconds, with over 95 per cent accuracy. By sampling just a few litres of water, producers can precisely count and analyze different development stages of shrimp and live feed species. Among aquaculture producers, XpertSea’s arrival will benefit shrimp hatcheries the most, paving the way for accurate and rapid counting of Monodon (Bagda) and easing the shipping process by giving precise inventory numbers. Since 2011, XpertSea has enabled local and multinational hatcheries, farms and research centers in over 48 countries to optimize their production, with over 17 billion organisms counted and more than 100,000 data reports uploaded and analyzed. Bangladesh shrimp producers, associations, and government representatives who would like to learn more or request a demo are invited to contact Ms. Chelsea Andrews at +1-207-717-3666 or by email at chelsea@xpertsea.com, or visit the website at xpertsea.com. XpertSea is a Canadian technology company that’s transforming how the global aquaculture industry farms seafood. Combining artificial intelligence, computer vision and machine learning, our solution empowers hatcheries, farms and research centers to track and manage their aquatic populations with greater speed, accuracy and insight than ever before. With aquaculture producers around the world using our technology to reduce waste and increase profits, we’re taking a business-friendly, technology-driven approach to promoting global food sustainability. With more than 100 customers in over 48 countries, we’re using Canadian know-how to help feed the world. For more information, please visit www.xpertsea.com. The XpertSea solution, including the XperCount, an automated smart device to count thousand of small aquatic organisms in second with 95%+ accuracy. XpertSea annonce la création d’une plateforme de croissance intelligente pour l'aquaculture.